Summary: Janet Collins was determined to be a dancer, even though she faced discrimination from an early age. Her mother was a seamstress who paid for her dance lessons by sewing costumes. Janet was turned away from ballet schools and told she could only join a professional company if she painted her skin white. She refused, and found other ways to dance. Finally, in 1951, the ballet master at the Metropolitan Opera House saw Janet dance, and hired her to be the first African-American prima ballerina there. An author’s note gives more biographical information, including two photos; sources and websites are also included. 32 pages; ages 4-8. Pros: The story is told in simple rhyming text, each verse starting with “This is” (“This is the girl/who danced in the breeze/to the swoosh, swoosh, swoosh/of towering trees”). 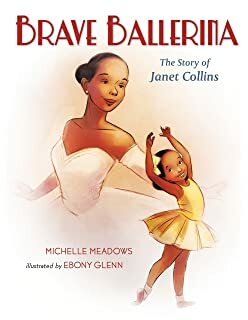 Young readers will enjoy the illustrations depicting Janet in various dance costumes, and will be inspired by her perseverance that eventually led to success. Cons: The text is so brief that many details are omitted, and some of the people are just referred to as “the teacher” or “the man”; some of those characters are identified in the author’s note, but more information sources would be needed for any kind of research report.